If you live in Los Angeles, you know how important a great smile can be. Porcelain veneers allow you to literally design your own smile. When teeth are stained to the point where whitening can’t help or are extensively decayed, damaged, or have lost their shape, veneers are often the best solution for an appealing, long-lasting smile. You may even want to consider veneers instead of the time and expense that orthodontia often requires. At your consultation, Dr. Zarabian will make a model of your teeth and talk to you about what you would like your smile to look like. As an experienced dentist, she can help guide you on what will look best with the bone structure of your face and jaw. Once you’ve made your decision, Dr. Zarabian will have a laboratory craft a mold of what your smile will look like so you can be sure that it’s what you want. Once you approve the mold, Dr. Zarabian will prepare your teeth to receive veneers. On the next visit, she will bond them in place. 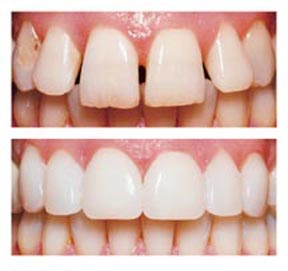 Since she uses color-matched cement, the end result is a permanent smile that looks completely natural. You’ll have a follow-up visit, and then you’ll be ready to smile with complete assurance for years to come. Give Dr. Zarabian a call and find out how beautiful your new smile could be.